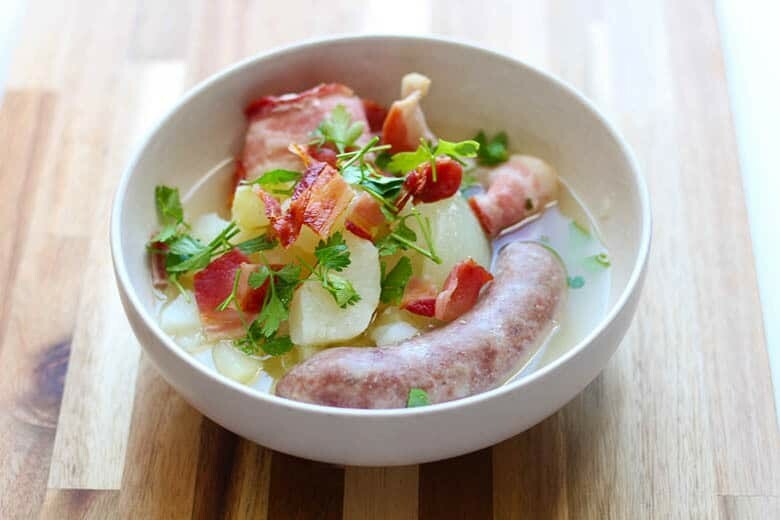 An easy and traditional Irish Coddle with just 5 ingredients. This hot soup is perfect with some Irish Soda Bread on a cold Winters day. 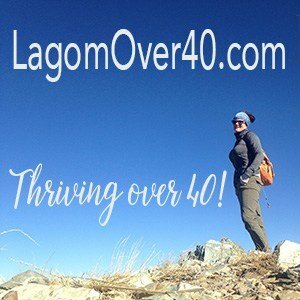 It doesn’t get much easier than this. There are only 5 ingredients in this traditional Irish Coddle, a hearty soup that you can dunk some nice Irish Soda Bread into. It’s no secret, I love soup. I eat it all year long. There is a soup for every season, every occasion and every ingredient. Coddle is one of my favorites. It has the simple clean taste I long for in soups and when served piping hot, warms my insides on these cold Winters in Utah. 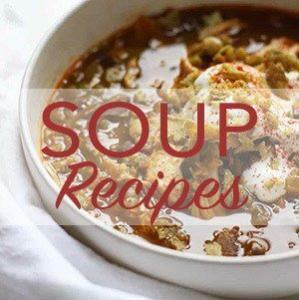 For some more soup recipes, click here. Originally Coddle was a stew that used up leftover meat on Thursdays and simmered slowly for hours. Fridays in Ireland were generally meatless days since Catholics weren’t allowed to eat meat. Using up leftover meat was very important in days before refrigeration. Each family had their own recipe and that might even change weekly depending on what food was leftover that needed to be used up. The food that was most available made it into the soup pot. Bacon and sausage were common meats in the stew but lamb would be added as needed. Potatoes, onions, cabbage, kale and fresh herbs where commonly used also. Thyme and parsley were widely available in Ireland so those were utilized regularly. Some old recipes included torn stale bread pieces and a robust stout to give it a little depth. It is believed that many Irish housewives left the stew to simmer slowly before going to bed so that their husbands would have something to eat when they got home from the pub. 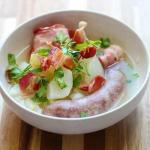 How do you make Irish Coddle? Coddle is a dump-all-the-ingredients in a pot kind of recipe that is simmered on low for as long as you want and then served with easy garnishes. 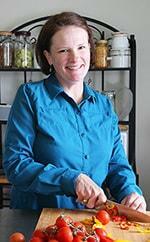 Try these recipes the next time you want to try some traditional Irish food, definitely save this for St. Patricks Day. Colcannon – A traditional mashed potato recipe made with cabbage or kale. Boxty – A potato pancake similar to a latke. Irish Stew – Lamb and potato stew, hearty and tasty. Irish Soda Bread – A dense, easy bread that bakes quickly without the need for rise times. Champ – Another amazing mashed potato recipe with green onions, buttermilk, butter and cheese. Although not an Irish food, Welsh Rarebit would be a great accompaniment to Irish Coddle. Luke Kellly and the Dubliners. An Irish folk band founded in 1962. Their lyrics spread into some controversial political messages which let to both an unofficial ban from folk purists and a stint on the Ed Sullivan Show. They were instrumental in popularizing Irish folk music in Europe and the U.S.
Irish Ways – A set of 4 CD’s with songs,music and poetry of Ireland. This is a deep dive into the culture and passion of the people. The Irish Rovers 50 Years – A lively group that got a break in 1966 when driving in California hoping to play in clubs. Their car broke down near an Italian restaurant owned by Irish immigrants. They were given free room and board and introduced to an agent securing them an appearance at the Purple Onion in San Francisco. They played to sold out houses for 5 months. After that, bookings in other folk clubs in California was easy. They signed for their first album that year. Whether you are cooking for St. Patrick’s Day or for your own exploration into Irish cuisine, may the luck of the Irish be with you and the wind be at your back. 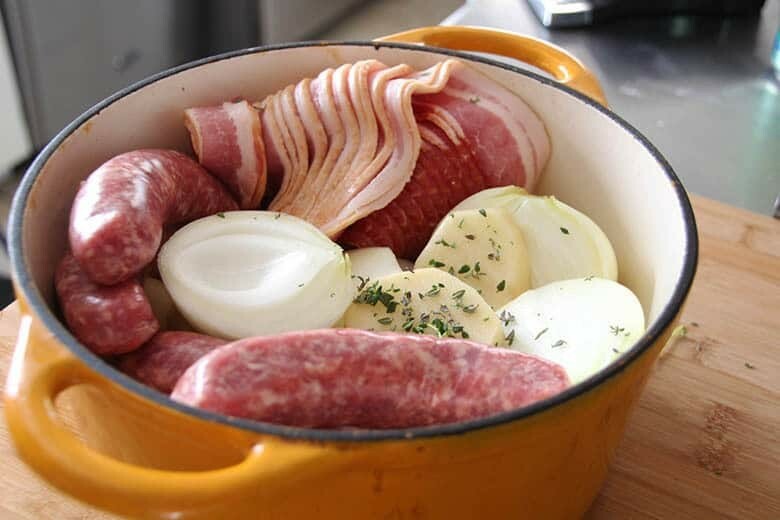 Traditional Irish Coddle Recipe. With only five ingredients, this authentic Irish soup recipe is both easy and tasty. You can easily feed a crowd with this traditional Irish dish. Perfect for St. Patricks Day! Place first 6 ingredients in a large soup pot, barely cover with water, bring to a gentle simmer. Continue simmering for at least 1 hour but longer is better. 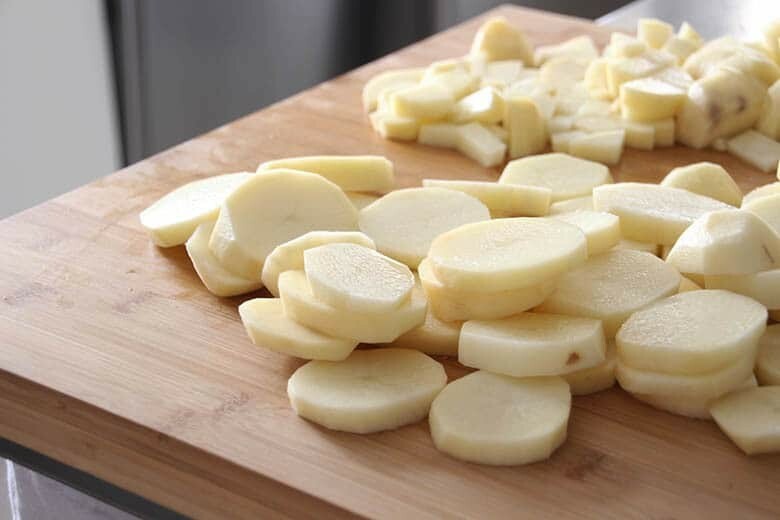 With a potato or bean masher, mash about half of the potato slices, simmer at least 30 more minutes to allow the starch to thicken the soup. You can easily adjust ingredient amounts to your desired taste. Feel free to use this as a base for using up left over food, especially meat, just like the Irish did. I like to cook bacon in the microwave, rolled up in paper towels until cooked and crispy. This makes for an easy clean-up and cooks up in as little as 4 minutes on high. I like to leave the sausage whole and then cut in half to serve. The sausage doesn’t fall apart this way. I’ve never had Irish Coddle before! I need to make this for my sister since her birthday is on St. Patty’s day! Five ingredients? Then it looks like I have no excuse not to make this ASAP! I KNOW, hard to believe something so yummy is so easy! I love the history lesson here – what an interesting way to use leftover meat! This soup looks absolutely simple and delicious! This looks amazing and I really love that you gave the background history on this dish. Can’t wait to make this for St. Patrick’s Day. I LOVE coddle but I never knew how to make it. Thanks for sharing this, gonna have to make this soon!